Now, at last, Cook brings the “Glittering Stone” cycle within the Black Company series to an end . . . but an end with many other tales left to tell. 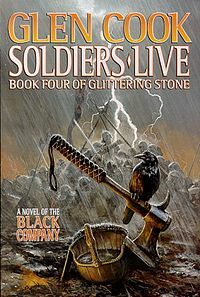 As Soldiers Live opens, Croaker is military dictator of all the Taglias, and no Black Company member has died in battle for four years. Croaker figures it can’t last. He’s right. For, of course, many of the Company’s old adversaries are still around. Narayan Singh and his adopted daughter–actually the offspring of Croaker and the Lady–hope to bring about the apocalyptic Year of the Skulls. Other old enemies like Shadowcatcher, Longshadow, and Howler are also ready to do the Company harm. And much of the Company is still recovering from the fifteen years many of them spent in a stasis field. Soldiers Live was a great ending to an epic fantasy series! This book was really exciting and I loved how it wrapped everything up and answered all the questions I had. I am definitely satisfied with the ending especially with Croaker and Lady and what happens with them. Out of all the books in the series I believe this one was the most emotional. After following some of these characters for so long you develop some attachments to them and it is hard to let them go. Especially, when Cook isn’t afraid to kill off his characters. There really aren’t any original members left after the end of this book and I can say that I shed some tears along the way. I thought the pacing of the book was pretty decent. It had its ups and downs throughout but never became too slow. I fell like the ending was a little rushed and less time was spent on it than on other less important events, but I enjoyed the ending anyway. The aspect of this novel that I loved the most was that Croaker was back as the narrator! Finally! I missed his annals so much. However, as you read his annals you can really tell how much he has changed over all these years. He really isn’t the same Croaker from the first few books, though I still enjoyed everything from his point of view. He feels like an outsider in his own company now because so many of his brothers have passed on, and I felt so bad for him. It was also strange that he wasn’t the Captain of the company anymore. Nevertheless, I really enjoyed his annals as they were better than both Murgen and Sleepy’s annals. Overall, I thought this was a great ending to a fantastic series! It is a must read! You will love it! Read the omnibus version of this book!